These are leather sheaths for custom/bench made knives which don’t have a page of their own. This Woodlore is the real article, not a copy! It is even more special as it has a bone handle denoting it as an instructor’s Woodlore, these are only given to qualified instructors at Ray Mears’ Woodlore bushcraft school. This particular sheath was modelled in part (at the customer’s request) on a Rob Bayley Raven sheath so some of the design points are a little different to how I would normally go about things. 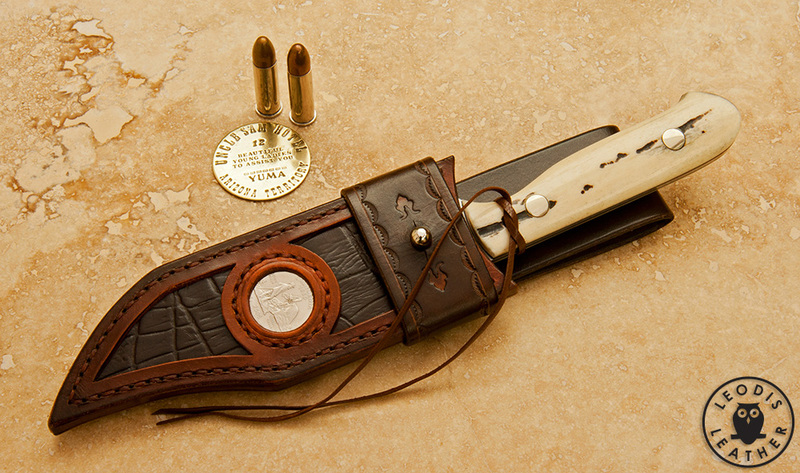 This Old West style clip point bowie with jigged bone handle belongs to me and I made this cowboy/frontier style leather sheath to go with it. 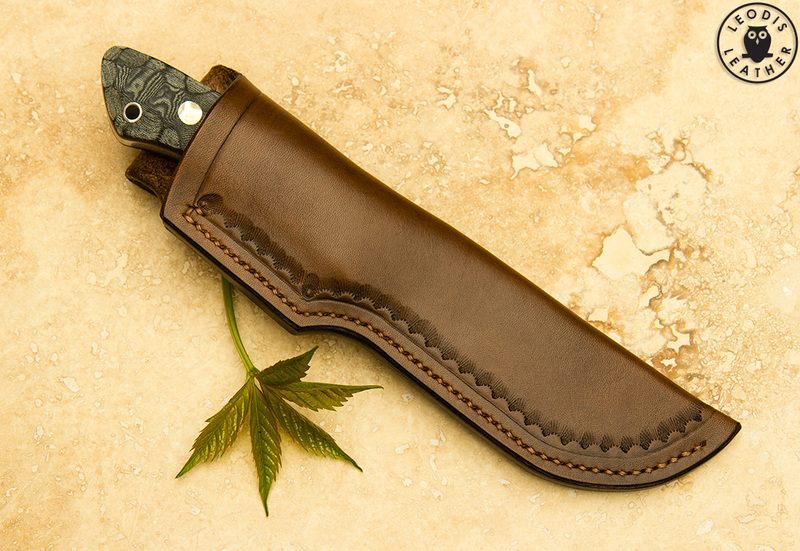 This sheath uses a Sam Browne stud and a ‘frog’ as was popular on this type of sheath. This allows the sheath to be hung from the belt or the frog can be removed so it can be slipped inside the belt or trousers on its own. 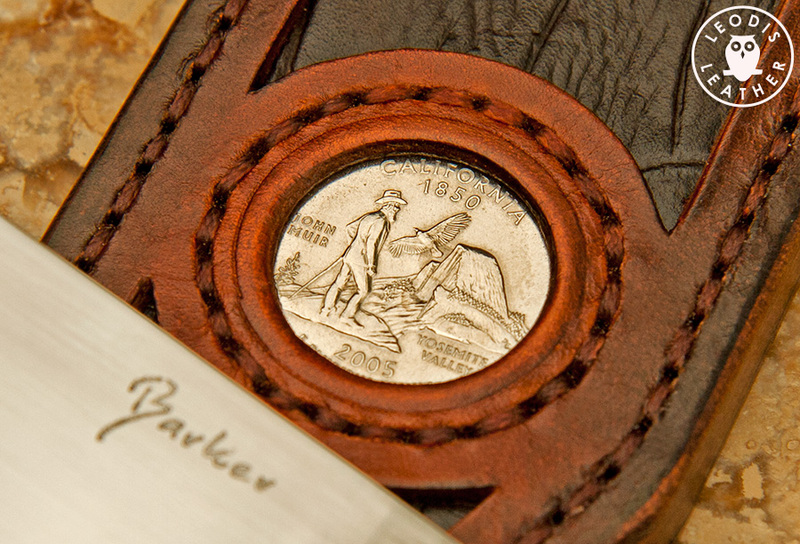 The sheath has a limited edition California state quater featuring John Muir inlaid into it as well as some vintage mockodile. I picked up the quarter on holiday in California in 2005 and I love Yosemite so it’s a nice reminder of the park for me. This sheath is for a one off custom knife nicknamed the ‘Brute’ which belongs to me. 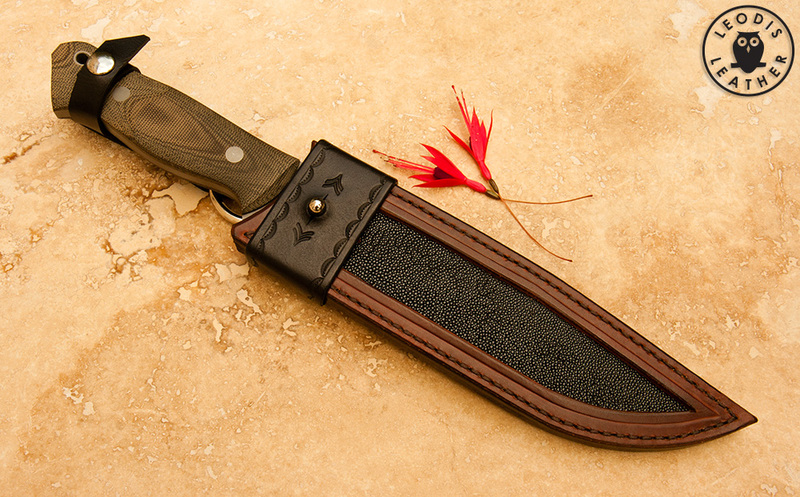 The sheath has a bottom part with a black stingray inlay and then a frog system housing a dangler belt loop. 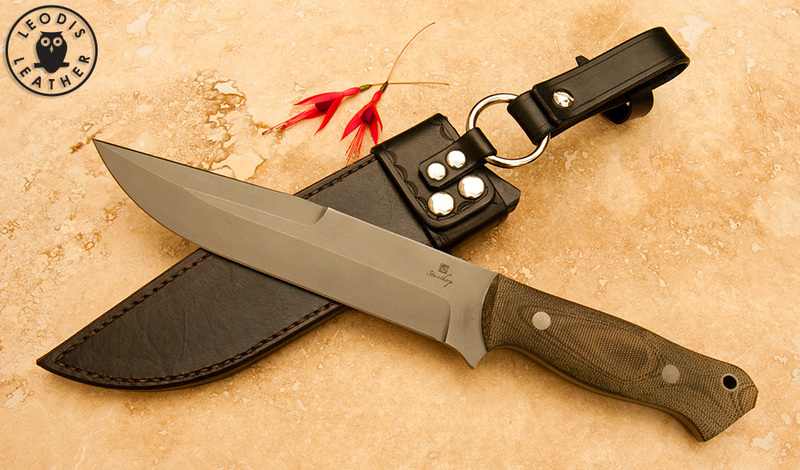 Kent Cutlery (Colin McIver) is a custom knife maker based in Kent in the South of England. 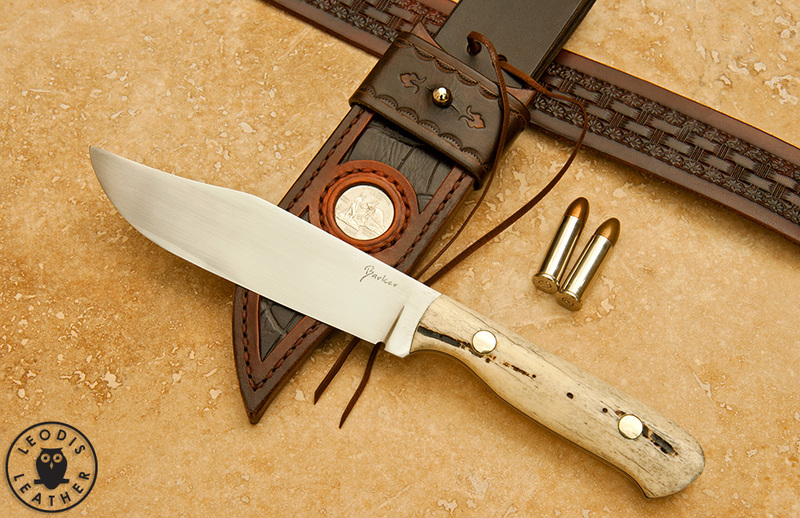 This knife was made by Colin for his friend who was deploying to Afghanistan. He asked me to make a sheath for it and this is what I came up with! This is a complex sheath which took 4 hours to design and around 14 hours to build. The sheath had to be MOLLE compatible, multi-position carry and able to fit a large military belt as well as housing a diamond sharpening rod. I decided to give the sheath a custom desert tan camouflage dye job to fit in with the desert uniform. I did this by laser cutting area and detail camo templates and then double stencil airbrushing all the parts.